First off I loved working with these two! They are so upbeat, down to earth and up for anything. I could do so much with them because they fully trusted me to ‘do my thang,’ haha! 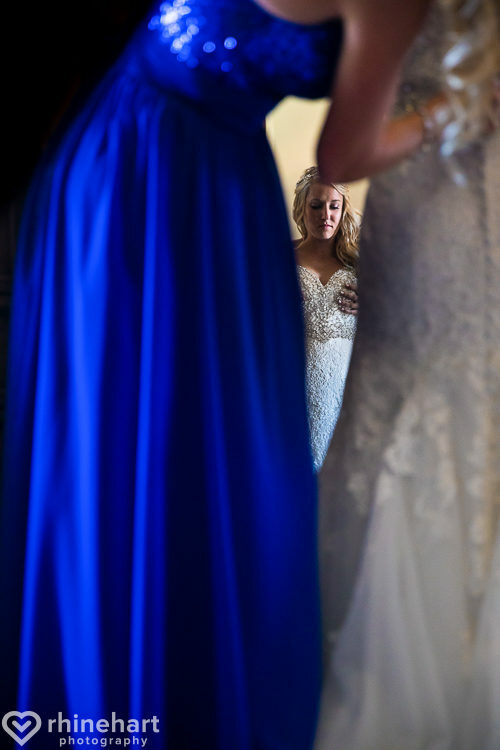 I love to play with colors and light and framing and reflections, all those elements came together in this shot of Allison’s sister’s helping her dress. You can see the detailing of the royal blue dresses with chiffon and sequins also the lace detailing, bead work and buttons on the back and from of Allison’s dress all at once. Allison and Rob coach middle school basketball and Allison brought a basketball along on her wedding day! Allison’s bridesmaids were as fun-loving as they were beautiful! I loved working with these ladies, especially her maid of honor, Ashley, (to the left of Allison) whose turkey farm engagement actually contributed in ranking me as one of the “Top 50 Wedding Photographers Worldwide” in 2016. Haaa they were also up for anything, like me. I may or may not have been laying on the ground as they tossed a basketball over my head here, lol! I real exercise in trust, haha! I loved the blue sky (almost matched their gowns) and thought all of their fingers and expressions were just so funny! Haa, one of the most serious looks Rob wore all day– tying his bow tie, the quintessential gentleman. This photo says so much, so beautiful and intimate!!! I caught a bit of Allison’s reflection in the mirror as she put on her veil, deep breath, girl, things just got real…. I like the gold framed mirror the gold wall and red curtain, all such interesting visual elements that allowed Allison to shine and be the main focal point in the room. This was a hard choice– I have so many adorable kid pics in their full set, but choosing which aisle shot was best for the blog… tough decision! I went for this one of Jace, the ring bearer, tossing a bunch of flower petals in the air with such joy and exuberance that his sign flies up in the air, lol! 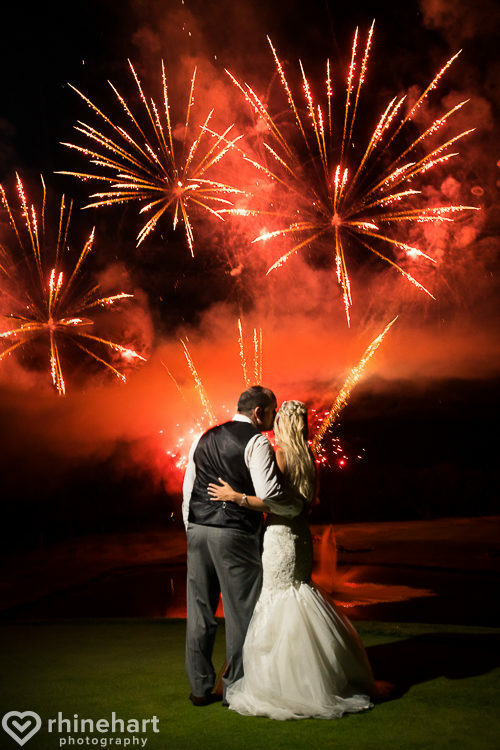 Rob shared about their choice of Woodstone Country Club in Danielsville, Pennsylvania… I’d consider it to be part of The Lehigh Valley, but it is also close to the Poconos… so I’m not exactly sure, but I think you get the general idea of where it is. I love to play with perspectives, too… I’ve gotten pretty good at composing and focusing a shot while my camera is sitting in the grass, haha! I move around a lot on a wedding day, some couples and vendors in the past have compared me to a ninja, haha. Here I climbed all the way up this hill behind the ceremony site, I used a wide lens and captured random sunbeams and rainbows as they passed through the trees and over the gathered guests. Monkeys see monkeys do, lol!!! They stood looking out over the view, taking time to be alone and soak it all in while the rest of their friends and family were at cocktail hour. Lol, all of the bridal party entrances were fantastic… for the blog post I paired it down to just these two. This one really gives you a feel of how amazing both Allison and Rob’s parents are, so joyful and fun, you can see where they both get it! Again that fun-loving, go with the flow side of their bridal party really came out in all of these, but this entrance made me laugh out loud! 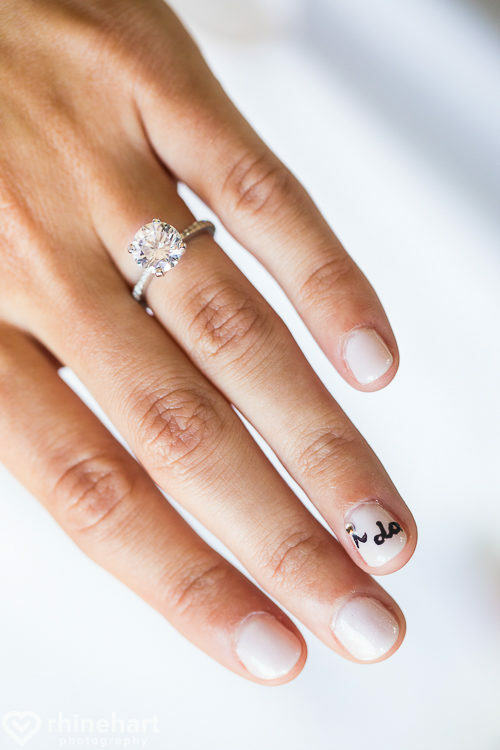 She and her sister, co-sang and co-wrote Taylor Swift’s, “Love Story” with customized lyrics to fit Allison and Rob’s love story, and sang it in front of all 200 guests!!! Ride ’em, cowboy! Don’t fall, Rob!!! Allison’s dad was awesome, not just for the shoulder lift and “dead bug” version of “Shout” (more of that in the full set) but also for this incredible fireworks display. It was seriously as nice if not nicer than the one my town puts off every year! Not Kidding. Again, so many shots but this one was kind of perfect– I love the little sparkles behind Allison’s tiara! This shot was captured earlier in the day, but I thought it might be a nice final image for them. I like how tiny they are in the shot. It sort of gives you that feeling of being really small, yet part of something bigger, perspective at the end of an incredible, best day of your life, sort of day. If you want to see more of Allison and Rob, check out their engagement session here– they had two parts– one basketball the other out in nature. Thank you, Allison and Rob for entrusting me with capturing this day for you. I hope you and your family and friends enjoy the blog post. Please feel free to comment below or share on social media. Again if you want to see more pics, click here to check out their engagement.